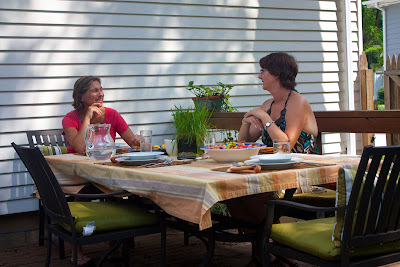 Summer means barbecues, picnic, cookouts, all manner of get together with neighbors, family and friends. With so many events though it’s easy to fall into the rut of burgers, brats, dogs etc. I was asked by The Motherhood to get together with some very lovely ladies (Vanessa from ChefDruck Musings, Michelle from Honest and Truly, and Hyacynth from Undercover Mother) to think outside of the summer cookout box. We set out to create a flavorful Mediterranean flavored menu that will definitely stand up and get noticed at your next party! This peach chutney was a breeze to whip up and absolutely delicious with both chicken kebabs and pan fried pork chops. Chop the peaches, shallots, and onion. Heat the olive oil in a small saucepan. Add the shallots and onion and saute until soft, about 5 minutes. Add the peaches, lemon juice and zest, sugar, and vinegars. Stir well. Lower heat to medium low and let simmer, stirring occasionally, for 15 to 20 minutes, until the chutney has come together and is a little brown. Will keep in the fridge for 2-3 days after preparation. Grilled chicken kebabs can be quite dry but marinating them in the Lawry’s Balsamic Marinade kept the meat tender and delicious. Wash and cut the chicken into 2 inch cubes, removing most fat and the tenderloins. Place chicken in a bowl and cover with the marinade overnight. Preheat your grill with one direct heat zone and one cooler indirect heat zone. Soak bamboo skewers in water for an hour. Peel, core, and cut the pineapple into 2 inch cubes. On separate skewers, to maintain even cooking, thread the pineapple. 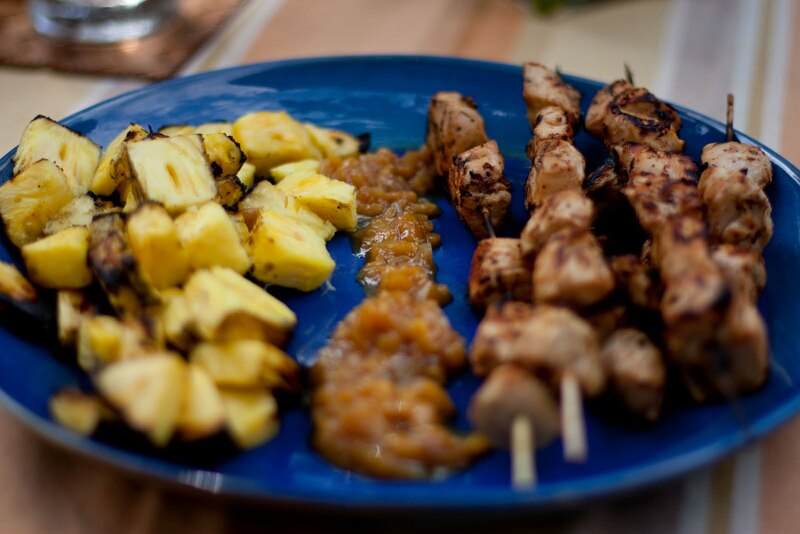 Mixed fruit and meat skewers may look prettier but they don’t cook as evenly or safely. Cook the chicken first on indirect heat, 5-6 minutes on each side. Cook the pineapple second, also on indirect heat, 2 minutes max on each side to have it caramelize but not burn. Serve immediately, or place in the fridge to serve cold. The peach chutney makes a delicious dipping sauce. This was delicious. I have never had chutney before because I thought I didn’t like cooked fruit. Our meal challenge has really opened my eyes to some new flavors (cooked peaches being one of them) and I thought it was delicious! Since the pineapple tends to cook faster we cooked those separate so they woulnd’t char. If you were serving at a party you could re arrange on to nicer metal skewers once cooked before presenting on the plate. 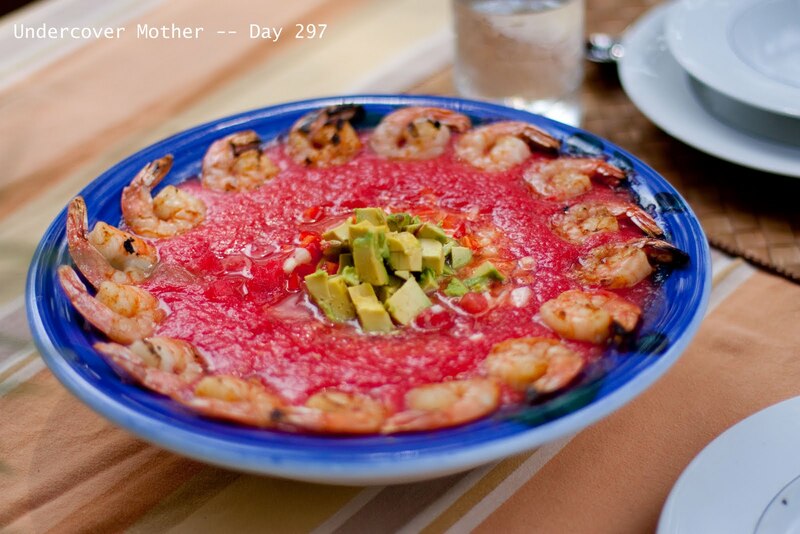 This delicious summer soup was adapted from an Watermelon Gazpacho with Grilled Shrimp Eating Well Recipe. Mix watermelon, cucumber, bell pepper, white wine vinegar, balsamic vinegar, and olive oil in a large bowl. Measure 3 cups of the mixture into a blender or food processor and puree. Transfer to another large bowl. Puree another 3 cups and add to the bowl. Taste the soup and salt as desired. Top with the remaining diced mixture and the avocado. Season the shrimp with Lawry’s Seasoned Salt. Thread onto skewers. Cook on direct heat for 3-4 minutes on each side. Remove the shrimp from the skewers and arrange them prettily around the soup. I have never had gazpacho before. Traditional gazpacho just kind of looks like a bowl of salsa to me and why would you eat salsa? 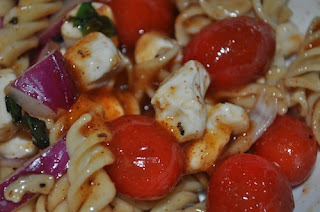 This however was perfect and tasty for a hot (very hot) summer afternoon and since it required NO cooking it’s even better. Okay there was some cooking you had to grill the shrimp, but I don’t eat shrimp so for me it’s a great no cook recipe! Toss everything together and stir in Lawry’s Balsamic Herb. Let it sit together for a few hours in the fridge for the flavors to meld, then serve cold. Overall it was a great afternoon with friends and food! Want to take your food on a Mediterranean vacation too? Lawry’s is providing one reader the same gift box I received! to respond or a new winner is drawn. Good Luck and Happy Grilling! Disclosure: I was compensated by The Motherhood on behalf of Lawry's and was provided a stipend for groceries and the Lawry's spices in exchange for coming up with a menu, cooking it, and posting about it. All opinions and content from the post are mine. That grilled pineapple sounds so yummy! 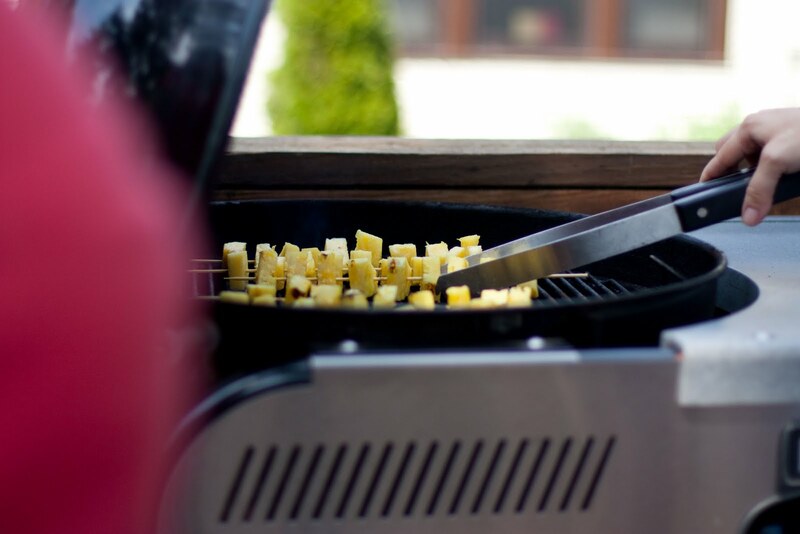 I'm the main griller in our family -- less pots and pans to wash! I grill pork chops a lot -- it's something even the girls like to eat. My favorite is Turkey Burgers!! Yum! My favorite cookout menu item would definitely one I didn't have to grill...lol! I'm all about grilled veggies like zucchini and bell peppers! Yum! My favourite menu item is homemade bacon hamburgers and grilled red peppers! My favorite for cookouts is BBQ chicken or burnt hot dogs. Yummy!! I like to make roasted potatoes with onions on the grill. I put them into an aluminum pan with oil, butter, spices, and salt and just let them cook for an hour or more. They always taste great! The kids and I love when my hubby makes Kabobs! Using whatever veggies we have on hand with shrimp or beef! My fav is ribs and potato salad! My fave cookout food is always BBQ chicken!!! Yum!!!! I love ribs... i think i want some now!! !